Across the globe, 100 million businesses are launched annually. To put that into perspective, that’s about 11,000 per hour. That makes for intense competition across the scale. As a result, 90 percent of those businesses won’t succeed. How can you put your business in the 10 percent that will succeed? A key thing that much of the 90 percent failed to implement is an effective marketing strategy. 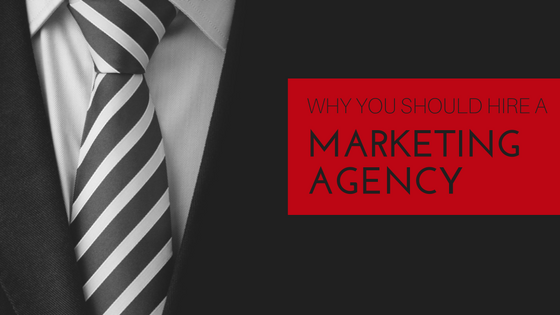 Here’s why hiring a marketing agency will help get your business in the 10 percent. As a business owner, it’s important to stick to a budget. You don’t want to skimp on things, but you also don’t want to spend unnecessary dollars. Many business owners pay thousands of dollars in pay per click advertisements to get on the first page of Google. When they realize that they could be getting more bang for their bucks with a different approach, it’s usually an instant switch. On average, optimizing your website for search engines (SEO/search engine optimization) is about six times more productive and effective than pay per click advertisements (PPC). Clients typically implement an SEO strategy and save thousands of dollars every year. Outside of choosing a cost-effective search engine strategy, some business owners decide to hire an internal marketing professional or hire a freelance marketer. Hiring one person over an entire agency may seem less expensive, but in reality it’s not. Hiring a good marketing agency will cost you around $2,500-$5,000 a month, which will be about $30,000-$60,000 annually. Comparatively, hiring someone in-office, will cost at minimum $53,000 a year, before benefits, which will get you a mid-level graphic designer. Plus, for a marketing manager, you’re looking at around $75,000 (also before benefits). So that’s two in office people to run your marketing for $128,000 a year (before benefits, etc), who may not have the skills you need, or you can hire a marketing agency that has a variety of people who possess different skills, for at most $60,000. It makes a lot more financial sense to go with the agency. Sometimes business owners try to take on marketing alone. They know a digital presence is important, and they’ve seen how much Facebook and Google are used by their consumers. So they’ve tried to scramble a few important platforms together. They have a surge in interested consumers that drops off almost as soon as it begins. The confused business owner then has to figure out exactly what happened: where the surge initially started and why it ended. Was it the website? Facebook? Twitter? Instagram? A promotional email? There’s so much that goes into marketing analytics, if you don’t have someone with experience, it could quickly get to be too much. Ineffective marketing strategies can be a huge and unnecessary waste of time. Time is too vital for business owners to throw it away on something that can be easily prevented by hiring a marketing agency. An agency can also offer your business a different way to think about something. It’s dangerous for a business to be adverse to change. Having the “we’ve always done it that way” mentality can be detrimental to business growth, especially in today’s fast-paced society. A fresh perspective can do wonders if you need a website redesign or a new social media strategy. As a marketing agency, it’s our job to keep up with the latest marketing technologies, apps and software. By partnering with an agency, you have access to that ever-changing technology. A marketing agency should have the software they’ve invested in to provide the data they need to effectively run your marketing campaigns. An agency will also know which digital platforms on which you need to have a presence. How will you know if the next Instagram or Facebook is coming if you’re concerned with labor costs, customer service and tax season? Without technology and innovation, you’re ignoring vital parts of your business. A good comparison would be putting passionate effort into your workout routine and ignoring nutrition completely; the results aren’t going to be what you want them to be at the end of the month without both. When business owners try to tackle marketing alone, little things can hinder progression and waste time. For example, not realizing simple things like the differences among Facebook business pages, personal pages and groups can waste a lot of time. Many businesses have Facebook pages that are not for businesses. I’ve gotten many “friend requests” from businesses I’ve frequented. Most don’t know, if you have to send a “friend request,” you have the wrong kind of page. There are businesses that have built a ton of social currency in their “friends list,” only to have all of their effort deleted by Facebook because setting up an incorrect page violates Facebook policy. In conclusion, hiring a marketing agency has many benefits that can help you reach your business goals. Not that that is established, stay tuned for information on how to choose the right marketing agency for your business. For more information on how to grow your business, please subscribe to the Never Stop Digital monthly newsletter. For more information on our digital marketing services, please visit our website, give us a call at (910) 338-1780 or send us an email at info@neverstopss.com. Set up your free consultation with a Never Stop Digital expert here.